Deinotherium. The Terrible Beast. A Proboscidean. The video below was one of my first introductions to the world of palaeoanthropology and 3D reconstructions of prehistoric life. It inspired me to learn more about the remote prehistory. This creature, a relative of the famed African Elephant, would have been between 4.5 to 5 metres in height at the shoulder, with a set of short downward-facing tusks and would have had a similar behavioural characteristics to modern day elephants. Nobody knows how long the trunk was, though the muscle attachments regions on the front of the skull can give some clues, its length remains conjectural. The set of downward-facing tusks have been the subject of much debate, ranging from sexual display to digging for roots and tubers to tree bark scraping. Again explanations vary. The Deinotheres has, thus far, been broken up into three species – D. giganteum, D. bozasi and D. indicum. The earliest examples of this group have been dated to about 23 million years ago (Early Miocene), while their extinction took place some time in the Middle Pleistocene, about 700,000 years ago. This was probably caused by the knock-on effects of climate change on the habitats in which they lived. The Deinotheres have a history that extends back into the Oligocene Epoch and this will be the subject of this discussion. As a side note, it is really sad that documentaries on human evolution and prehistoric beasts, do not explain the following. This is documentary material, in my opinion. As Gondwana began to rupture apart 184 million years ago in the Early Jurassic. Africa was the first isolated baby continent of Gonwana. It remained as such, quite literally up until about 25 million years ago, 159 million years of isolaton for evolution to work its magic on a limited diversity of placental mammals that called Africa, home. But given that elephant-like creatures existed in Late Oligocene (34 – 28 Million Year ago) Pakistan, land bridges must have developed between Africa and Arabia / Eurasia as the continent made the relentless push north. With such unimaginable tectonic forces at work, it is inevitable that volcanism increases in activity. The tectonic dynamics were such in eastern Africa million of years ago that a unique type of volcanic eruption occurred. Everybody is familiar with the power of water, in the form of slow development floods and the devastating flash-flood. Lava is equally capable of flooding the landscape, not as we all know it today, but on a scale that we cannot comprehend. Everybody is familiar with the Cretaceous – Paleogene Extinction Event, but few are aware of the most devastating mass extinction event in the prehistory of the planet – The Permian – Triassic Extinction Event. It was brought on by a truly massive flood basalt eruption. This is what quite literally created Siberia, that’s right Siberia. Today, 252 million years on, the remains of that basalt eruption covers an area of over 2 million sq km² and may, back then, have covered over 7 million sq km². Eleven flood basalt eruption events have taken place within the last 250 million years. The Eritrean Intertrappean Beds is a much smaller events and featured episodes of volcanic activity followed by laying down of fluvial sediment, hence the “Inter-Trappean”. These beds can be up to 100 metres in depth and cover many square kilometres. This intermittent event has been dated from 29 to 23.6 million years of age. 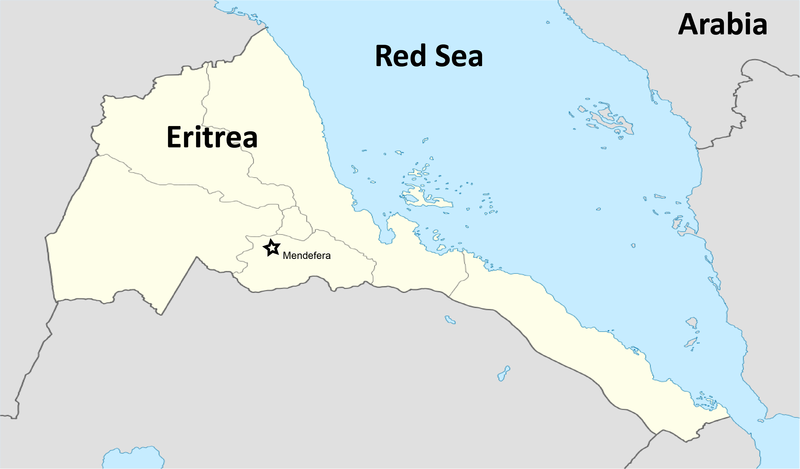 Mendefera, is the town capital of the Debub Region of Eritrea and it sits atop the Eritrean Intertrappean Beds. It was at a number of outcrops of fluvial mudstones and siltstones that fossils of the early ancestors of Deinotherium were uncovered recently, called Prodeinotherium. 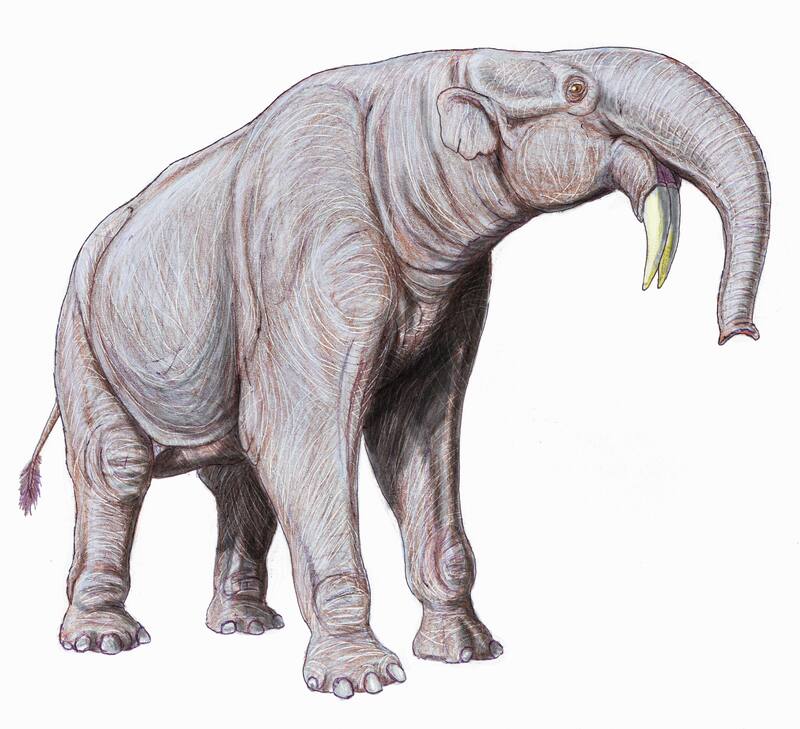 Numerous other sites have revealed early Proboscideans such as Gomphotherium, which is likely to be the earliest representative of this intriguing family. 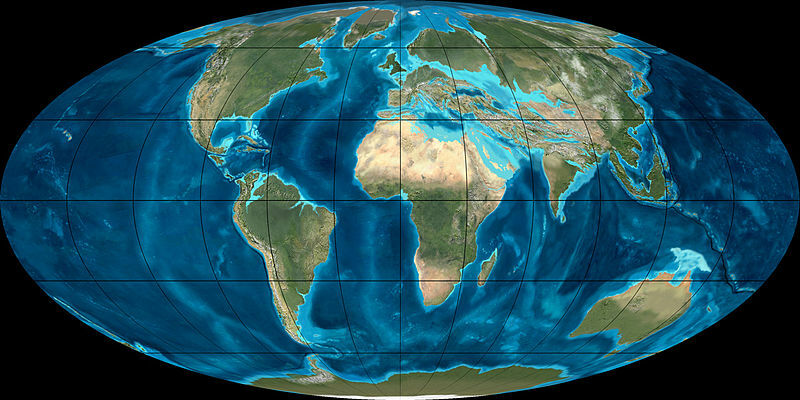 During the Oligocene, Arabia and north-eastern Africa flirted with the Tethys Ocean promiscuously. So the sight you might have seen from the Eritean highlands, back then was swamp, river and lake populated landscapes, perfect for tropical wet forests, especially when the basaltic volcanism of the area was on hiatus. As Africa edged closer to Arabia and Eurasia, the lack of diverse fauna, may have allowed a large influx of Eurasian fauna to call Africa, home for the first time. There are an estimated six Trans-Tethyan Paleogene mammalian dispersals all of which were limited by the availability of land bridges. So large herbivores could not cross into or out of Africa without substantial land bridge crossing points. By the beginning of the Miocene, there was a massive faunal turnover in the form of African endemic species dying out and the movement of Eurasia fauna south into the continent. This dynamic change in faunal movements also included the northward movement of Prodeinotherium into Eurasia, evolving into the Deinotherium we all know and love.